Base Running, First To Second; Stay In The Moment, Be Aggressive! 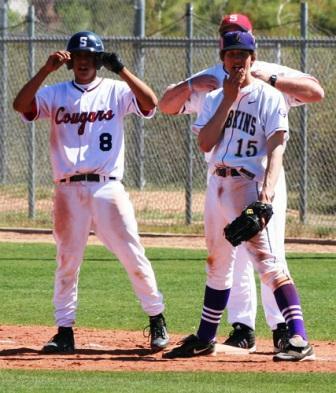 While base running, first to second, no matter what level you are playing, your first responsibility after successfully reaching first base is to look to the person giving the signs. Do this immediately. This process repeats itself after every pitch, no matter which base you are at. 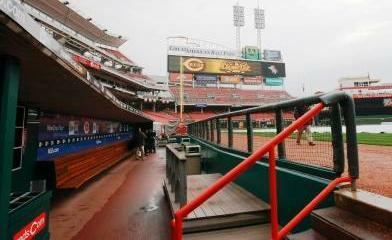 Once you have the sign, mentally remind yourself of the number of outs and what your reaction will be to a batted ball. This all happens quickly, as you need to be ready to take your lead when the pitcher makes contact with the rubber. He will have taken his sign from the catcher with his foot on the rubber. If you haven't been paying attention you may find yourself feeling you need to jump out into your lead to stay up with the pitcher, thus making yourself an excellent pickoff candidate. Avoid crossing your feet, use walking shuffle steps. Lead off from the inside, front corner of the base. From that position, you appear to the pitcher to have less of a lead than if you are in the middle of the base, or out from the back corner. It is not a big thing; but an advantage to yourself. They all add up! On a pickoff attempt, dive back to the inside, back corner of the base, keeping your fingers up. In practice, work on getting a lead that, with a crossover and dive, gets you back to the outfield side of first base. Leads are individual, some players can be further off than others. Work to find your limit in practice. Getting picked off in practice is free, in a game, expensive. If you can get back standing up, you do not have enough lead. Learn the steps for your leadoff and get that lead while keeping your eyes on the pitcher. Even at the high school varsity level, we see between two and four players on most teams, who will start into their lead, and look back to see how far they are at some point. We have someone in the dugout assigned to look for that every game and relay the information to our pitchers. If you are the base runner and look back to see where you are at, you won't see the ball coming, only hear the ball hit the first baseman's mitt. It is not a good feeling. As the ball is delivered to the plate, take two aggressive shuffle steps towards second base. Your second shuffle should finish up as the ball gets to the plate. If the ball is not hit, and is caught by the catcher, set your right foot and HUSTLE back to first base. ( this step is the same for all three bases ). Nothing will be gained if you hesitate or take your time completing this step. As you are shuffling, watch for the down angle of the pitch. When you become proficient at reading the angle of the ball, you will be able to pick up an additional base on balls in the dirt, which do not get far from the catcher, because you were looking for it to happen. React to the ball being hit. If there are two outs, you are running on any ball off the bat, even if you think it might be foul. If it is determined to be foul, the umpires will have you return to the base you started from. They will not, however, move you up to the base you could have advanced to, if you didn't run on contact. HUSTLE NEVER HAS A BAD DAY! With less than two outs, freeze on line drives until you are sure it is not going to be caught. You are running on all ground balls. 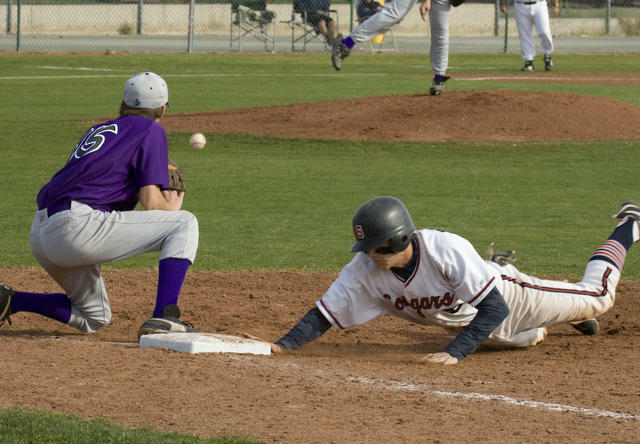 If the ball stays in the infield, prepare yourself to slide at second base, if there is a play there. When in doubt, SLIDE. 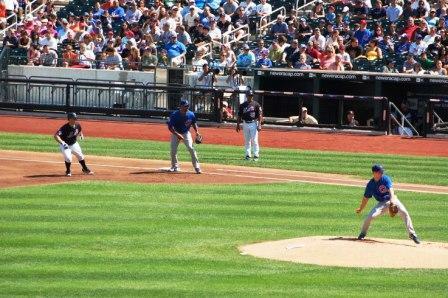 If it is a fly ball, gain as much ground towards second base as is possible, the distance based on to which field and how far the ball is hit. If caught, quickly return to first. If it drops, you will have a good chance to be safe at second, if you have worked on getting as far towards second as feels safe to you. Always know the situations; know how many outs, speed of runners on base ahead of you, the score and inning, so that you know whether your run is of immediate importance, or one part of a much larger need. Once you have processed the above, then you can go through the different scenarios in your mind before every pitch, so you are able to react, not think, when the ball is hit. It is possible for a base runners situation to change pitch to pitch, as the count changes. Stay In The Moment, Look To Be Aggressive! You can make a big impact as a base runner and you do not have to be fast. Create positive situations for yourself by staying focused. They will come to you if you work to make it happen!